Mr. Yasuyoshi Komizo, Chairperson-Hiroshima Peace Culture Foundation and Secretary General of Mayors for Peace paid a short visit to Kochi (India), an active member of Mayors for Peace in South Asia on September 26, 2014. Earlier Dr. Thomas Mathew, 2020 Vision Campaigner had met Mr. Komizo during the formers visit to Hiroshima to attend Peace Symposiums and Peace ceremony along with Japanese students, and the later assured that he will visit India in September 2014. Later he fixed the date on September 26, the ideal day for all of us, International Day for the Total Elimination of Nuclear Weapons. Thereafter Mr. Mathew contacted Mayor’s office in Kochi and other peace activists and peace groups in the Kochi city area to arrange a constructive program to mark the day. Honourable City Mayor Mr. Tony Chammany whole heartedly accepted his request and assured all support to make the visit of Mr. Komizo, a fruitful one. Though the visit of Mr. Komizo was quite short, Mr. Thomas Mathew organized two programs on 26th. The first program was organized for youth, been selected from ten colleges in and around the city, with the help of YMCA Kerala State Region. The meeting was held at the Catholic Renewal Center, Kochi at 9:00am. The students had a highly informative interaction with Mr. Komizo regarding nuclear threat and total elimination of nuclear weapons. Students posed various questions related to world peace including nuclear energy, chemical weapons, arms trade and the role of Mayors for Peace to fulfil the dream of total elimination of Nuclear Weapons. Mr. Komizo patiently answered all questions and the interaction provided both sides a feeling that more interactions and information should pass to the younger generations who are highly committed and devoted for a peaceful-world. Followed by, the main meeting started in connection with the UN Day for the Total Elimination of Nuclear Weapons. Dr. Mathew, the 2020 Vision Campaigner delivered an introductory speech and briefed the mission of symposium. He then introduced Mr. Komizo to the audience and the dignitaries on the dais. The symposium was enriched with the presents of dignitaries from various walks of life especially political, religious and social. Mr. K. Babu, Honourable Minister of Kerala State for Ports and Excise inaugurated the symposium and in his address he highlighted the importance of a peaceful world without a single nuclear bomb which is highly harmful to the human race. The Metropolitan of Indian Syrian Orthodox Church H.G. Yuhanon Mar Polycarpos, Swami Bhadreshananda-Head of Rama Krishna Math, Kochi and YMCA Kerala State President Mr. Lebi Philip Mathew addressed the gathering. On this auspicious day Mr. Komizo officially inaugurated YMCA Kerala State region’s (consisting 600 rural and urban YMCAs) signature campaign for Peace across Kerala state. Later Mr. Komizo had an interview with Kerala’s No.1 newspaper Malayala Manorama, and the same was published in a special supplement. Then they headed to the Kochi City office to meet the Honourable Mayor Mr. Tony Chammni for further exploration of Mayors for Peace activities in South Asia. Honourable Mayor and his associates welcomed them very warmly. In the meeting Mayor agreed to lead the Mayors for Peace activities in south Asia in the coming years. He also assured every possible support for the forthcoming visit of the Peace Boat in April 2015. Mayor also signed the Signature Campaign for total elimination of Nuclear weapons to boost the efforts of 2020 Vision Campaign in India with the cooperation of SEEDS-India an NGO in this field for last 25 years. 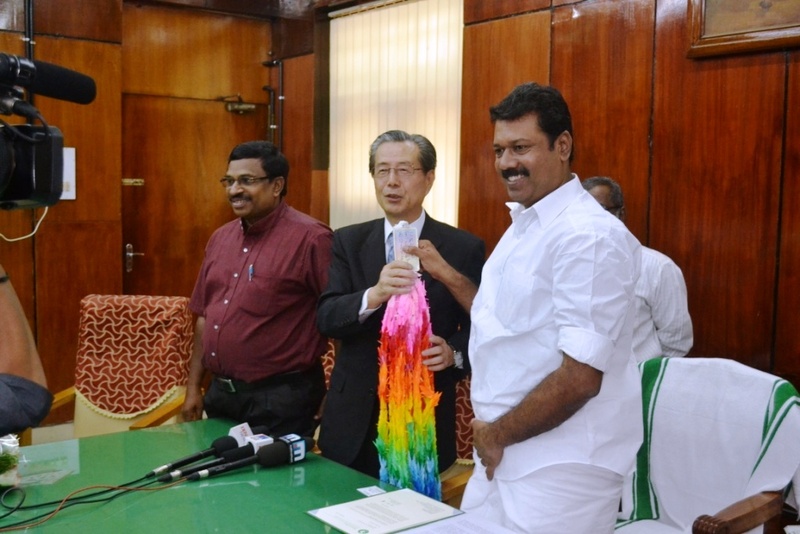 Mr. Komizo handed over the official letter from Hiroshima Mayor Mr. Kazumi Matsui to Mr. Tony Chammany to lead the Mayors for Peace activities in this region and presented him a Peace Crane garland as a token of his visit to Kochi. In turn Mayor presented Mr. Komizo with some traditional handicrafts of the state. The entire program was covered by major TV channels, newspapers and online media. Later Mayor’s office staff accompanied Mr. Komizo and Dr. Thomas Mathew to the Subhash Park opposite to the City Office, facing Arabian Sea. There they visited different corners of the park and pointed a particular area facing one side to the main city road, known as Mahatma Gandhi Road and the other to the Arabian Sea to install the Peace Flame and plant Aiogiri Saplings from Hiroshima. These hectic programs gave lots of opportunities for them to think and plan future activities of Mayors for Peace 2020 Vision Campaign. Mr. Komizo and Ms. Ayami Shibata expressed their gratitude to Dr. Thomas Mathew for his efforts to organize various constructive programs and meetings during such short visit at short notice. We hope that these initiatives will add more results for Mayors for Peace 2020 Vision Campaign in the days to come.